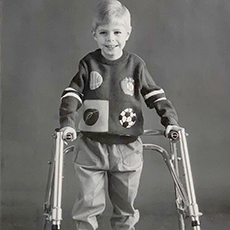 Easterseals Arkansas has been helping individuals with disabilities and special needs, and their families, live better lives for over 70 years. 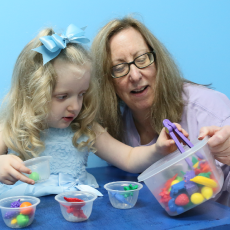 From child development centers to physical rehabilitation and job training for people with disabilities, Easterseals offers a variety of services to help people with disabilities address life's challenges and achieve personal goals. In 1944 Virginia Armistead started The Arkansas Association for the Crippled, now known as Easterseals Arkansas, and soon began serving children in local hospitals and school districts. Two years later, Easterseals opened Arkansas’ first inpatient facility for children in a barracks at Jacksonville Air Base for those recovering from polio and other conditions. Easterseals soon began the first speech therapy program in Arkansas, and the state’s first traveling “mobile unit” began providing physical, occupational and speech therapy to school districts all across the state. In 1957, Easterseals Arkansas started the state’s first work program for adults with disabilities. By 1966 Easterseals moved all operations to Lee Avenue in Little Rock. There, in one building, Easterseals operated a preschool, outpatient therapy, adult work program and inpatient children’s rehabilitation center. In 1988 the adult services division relocated to a newly renovated building in west Little Rock (a former skating rink). 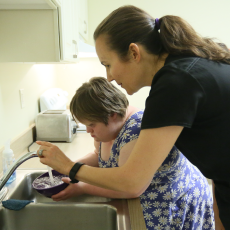 Two years later, the Butler Adult Living Center, a ten-bed living facility for people with developmental disabilities, opened on the same campus. In 1994 the 42,000 square foot Outpatient Services Facility was opened on Woodland Heights Road, establishing a new corporate office for Easterseals Arkansas. Four years later, the Children’s Rehabilitation Center was built next door and expanded to serving 40 children. From 2000-2005 Easterseals opened two HUD-funded apartment complexes, Armistead Village and Wilson Court. Hire Inc., another local non-profit, became a Division of Easterseals Arkansas focusing on employment of adults with disabilities in the community. The Grand Prairie Child Development Center in Stuttgart opened, offering pre-K special education and pediatric therapy. In 2009 Wilson Court II, the third HUD-funded apartment complex, opened. In January 2013 the Sharon Moone-Jochums Center for Training and Wellness replaced the adult services division and doubled the number of people served by the program. In 2015 Easterseals Arkansas opened Harold Court, its fourth HUD-funded apartment complex, raising Easterseals Arkansas total to 59 apartment units for people with disabilities. Easterseals Arkansas offers help, hope and answers to more than 20,000 people each year. We continue to live out our mission of changing the way the world views and defines disabilities by making profound, positive differences every day.